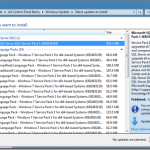 On January 21, 2013, Microsoft released SQL Server 2012 Service Pack 1 Cumulative Update 2, which is Build 11.0.3339. This Cumulative Update has 50 hotfixes by my count, and two new features (which is quite unusual for a SQL Server Cumulative Update). This CU gets the SQL Server 2012 Service Pack 1 branch to parity with SQL Server 2012 RTM Cumulative Update 5, which was released back on December 17, 2012 (although RTM CU 5 does not have these two new features). I have asked Microsoft about whether they plan on getting the two branches (RTM and SP1) back in sync, and so far, the answer is no. What this means (unless they change their mind) is that the SQL Server 2012 RTM branch will have new CU releases come out about a month before the “equivalent” release (with the same hotfixes) is released for the SQL Server 2012 SP1 branch. This penalizes people who have done “the right thing” by moving to SQL Server 2012 Service Pack 1 in a timely fashion. It will also create a problem for people who choose to stay on the latest CU of the RTM branch (to get the most current hotfixes more quickly) when SQL Server 2012 Service Pack 2 is released in late 2013. Once SQL Server 2012 Service Pack 2 is released, the 2012 RTM branch will be retired, and will be considered a “non-supported service pack” by Microsoft. Someone who is on the latest RTM CU, would have to move to either SP1 or SP2 to be in a fully supported configuration, but they would not want to immediately do this, since both the SP1 and SP2 branches will be behind the RTM branch in terms of released hotfixes. I could see a customer being stuck in this Catch-22 situation for two-three months, until at least a couple of SP2 CUs are released, and the SP2 branch is caught up to the last RTM CU. The customer could just wait a month, until the next SP1 CU is released, and then install SP1, and then install the latest SP1 CU, but that will involve more installations and more outages than if they did not have this problem. They could also create a Service Pack 1 slipstream installation that incorporated the latest SP1 CU to reduce the amount of installations. What do you think? Does having the CUs for SQL Server 2012 be out of synch matter or not? I am really curious to hear what people think. I kinda like that all SQL2008R2 CU’s come out together and I would hope that SQL2012 would be the same. We are now into a regular upgrade cycle for SQL2008R2 and now we are starting to use SQL2012 this will happen for those servers too. They should be back in sync. Both SQL Server 2008 and SQL Server 2008 R2 have kept the release schedule for Cumulative Updates in synch across their release branches (RTM, SP1, SP2, etc.). This is what people are used to, and probably expect. I am kinda puzzled, if you have SQL Server 2012 SP1 Cumulative Update 2, then what’s the purpose of the SQL Server 2012 RTM Cumulative Update 6 ? If you are on SP1, you don’t need RTM CU6. It is for the RTM branch. If you are on RTM, you don’t need SP1 CU2. 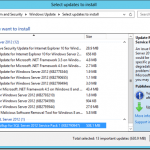 Cumulative update package 2 for SQL Server 2012 Service Pack 1 – SQLServer2012_SP1_CU2_2790947_11_0_3339_x64 [ 508 MB ].